Shalog: Pressure Overdrive - Step up a gear! петък, 14 април 2017 г. Pressure Overdrive - Step up a gear! Count Soap is stealing all the water in the world in order to open his Uber-Spa, but nothing is lost yet as La Resistance is here to stop him! You are a member of La Resistance and alone or together with a friend you are about to blast some bad guys. Only one thing, before going into the game - I was provided a key from the developer Chasing Carrots and the is expected to be out in Q2 this year. Or should I say this version of the game as Pressure Overdrive is actually remake of 2013's original title - Pressure which sadly did not take off well, but luckily Chasing Carrots took the criticism to hearth and went back to fix their game. And because this is how I roll I will be honest and here and now will say that I have not played Pressure, but I can tell you about this one. The title says it pretty clearly. This is what you gonna do when you are not in Le Bistro, tinkering your buggy. More details, you say, I am glad you asked! 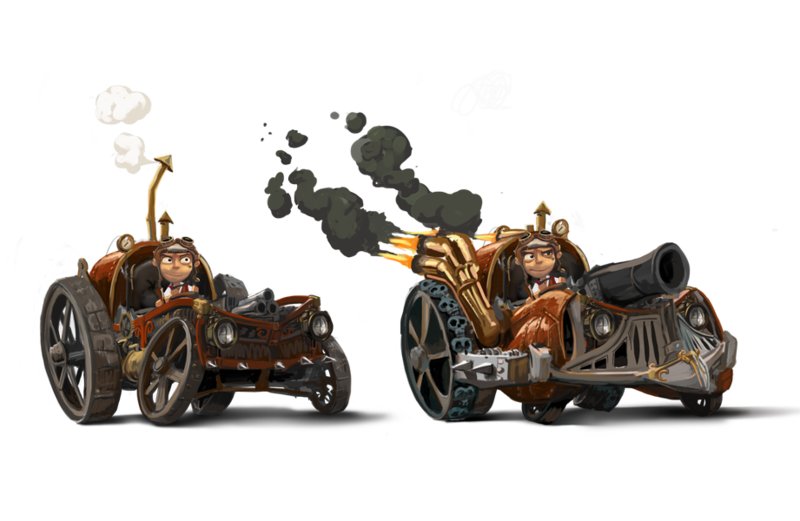 Pressure Overdrive is steam-punk arcade race shoot em up game where the goal is not to reach the finish, but to survive until you get there as the track is packed full of enemies of all kinds. Small tanks, punks on bikes, giant trucks spilling acid, motor boats and even bosses at the end of each world. The game reminds me of Tank Racer(and this is quite the inaccurate comparison I know...) but a lot more dynamic and frantic with packs of enemies all around you, smashing fences, gun towers, flying above bottomless pits and crashing through explosive barrels. BANG!BOOM!KABAW! The game is action in its purest form and it involves a good amount of skill too as you will have to drive, shoot accurately and dodge bullets all at the same time. 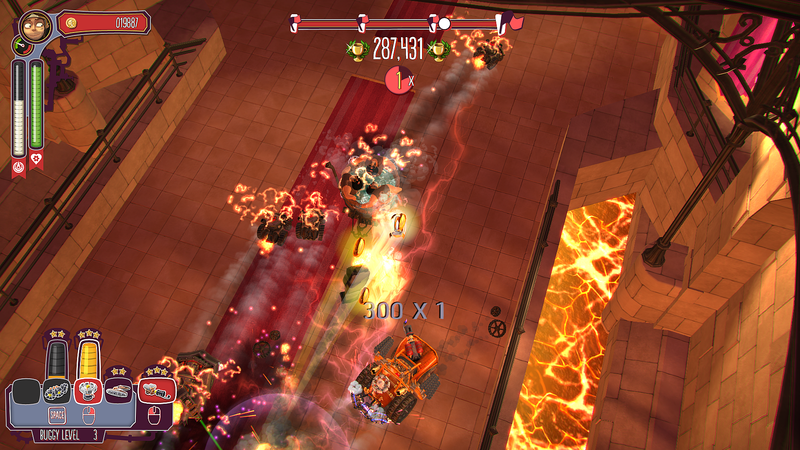 Le Bistro is your garage where you can make your buggy a real mean machine with spikes at the sides and swirling blades at the front, all this finished with a shotgun to rain fire on those who does not dare to get close to you. Or you can put a big mortar and just blast everyone away from afar. There is good amount of upgrades and styles of play depending on what you put on your machine, so you will never be bored with your car while you make it into real weapon for mass destruction. 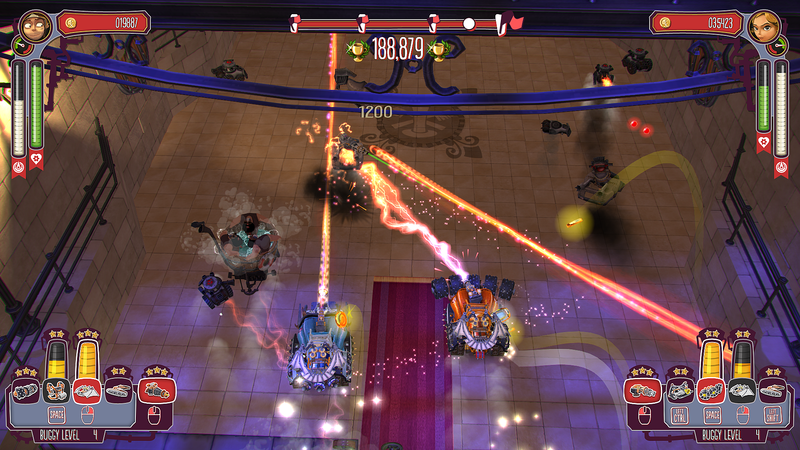 Pressure Overdrive is great combination of race and arcade shoot em up game. 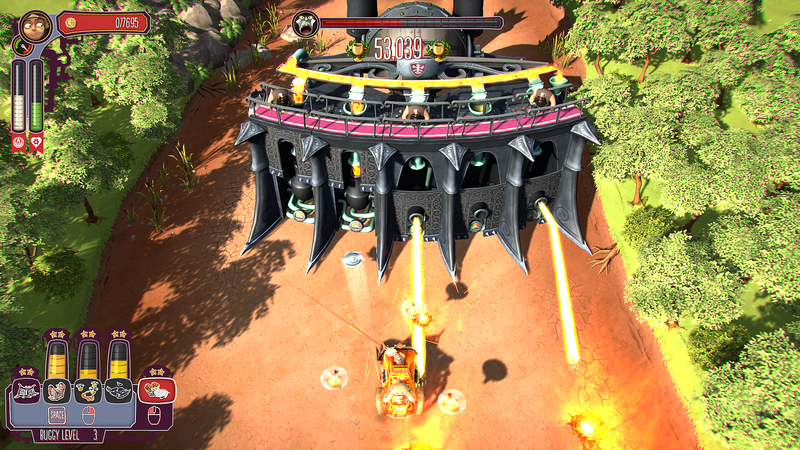 It is frantic, colorful, full of action, fun, full of different, wacky, but nasty enemies. It has 3 worlds with more than 30 levels for you and a trusty friend, to test your skills in a bullet filled race or hair standing bossfight. And when you beat those there is the endless mode, only for the best of the best. It is a kind of game which I have not seen for long time and while is not exactly my cup of tea, I had great fun with it and hard time putting it down. It is clear that Chasing Carrot has put some serious work in it and I hope it will be the success it deserves to be. The game is expected to come out in Q2 this year for PC, PS4, Linux and Apple OS. Публикувано от Sharki в 13:58 ч.